Minister Aluvihare inspects the goods along with other officials. 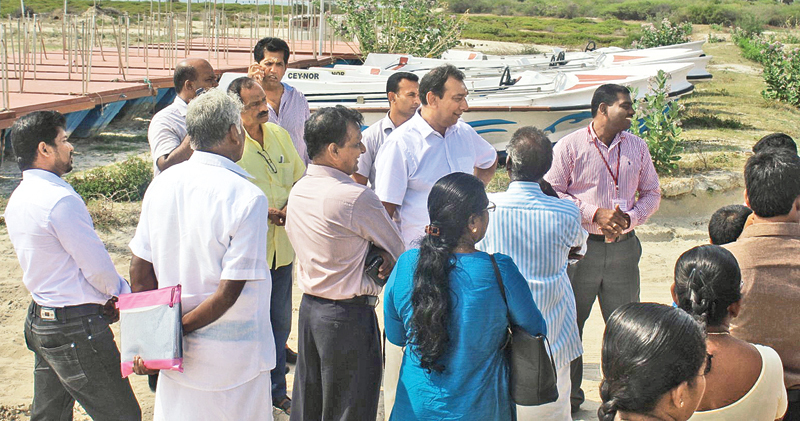 Tourism Development and Christian Affairs State Minister Ranjith Aluvihare instructed to initiate an investigation into the import of goods to the value of Rs 50 million for a jetty in Velenei in Jaffna to develop it as a tourism zone even before formulating a plan. The goods were imported in 2016 and dumped on the Velenei beach for the past three years. The Minister asked to recover the loss from the responsible parties. The Tourism Development Ministry was asked to commence the project immediately and complete it before December 17. The Minister visited the location and inspected the equipment. A petition was sent to the Minister by the residents in the area in this regard.